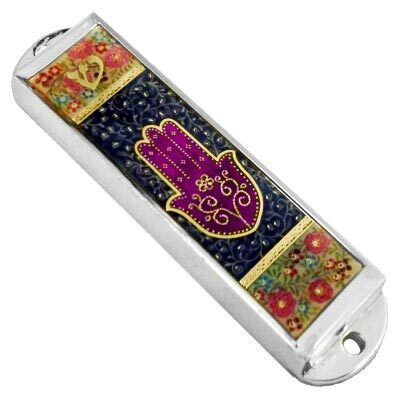 The Hamsa Is Prominent On The Front Of This Mezuzah Surrounded By A Very Colorful Design. The Shin Is Centered At The Top. The Mezuzah Is Made From A Silver Plated Metal. It Measures Approximately 4" X 1". The photos did not show the true beauty of this mezuzah. When I highly recommend this mezuzah to anyone!